This is the time of year when every weekend sees the bunting come out for a gala or carnival. 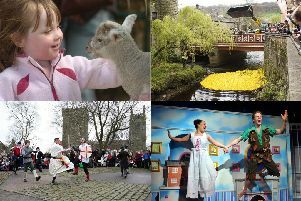 Two weeks ago we were all wowed by the Handmade Parade in Hebden Bridge and last week saw the annual Heptonstall Festival and the newly relaunched Mytholmroyd Gala taking place in glorious sunshine. We can’t always rely on the weather in the Pennines, of course – some years have seen costumes and floats nearly blown away by driving rain. This year the weather was kind. Perhaps we are seeing the early warning signs of climate change, but nevertheless it’s hard not to enjoy the good weather after the long winter we endured. Behind every successful event lies a host of hard working volunteers putting up the tents and stalls, acting as stewards, refereeing the welly wanging contests and rattling the collecting tins to raise money for next year’s event. I took my granddaughter to the Mytholmroyd Gala last Saturday, and I was very conscious of the work that had been put in. For example I know that volunteers camped out overnight in the big marquee to ensure it was safe. This sort of commitment is often hidden from sight but it represents community spirit at its very best. Behind the scenes Calderdale Council and the town and parish councils are also playing an important role, even in these cash-strapped times, to ensure that our community life is a rich one. I don’t know if, like me, you have been down to Calder Holmes Park early in the mornings and noticed the Calderdale parks team clearing away the rubbish from previous days’ enjoyment and sprucing up the flower beds. They may not always get the thanks they deserve, so I’ll thank them here in print – we very much appreciate their contribution. The council helps in other ways too. There is advice available on the necessary insurances, licenses and permissions that are required to run a safe event for the public in our parks and streets. Each Calderdale council ward has a small grant fund for local community organisations which is allocated throughout the year by the three local councillors. There is a simple application process and the successful bidders and the amounts given are reported at Ward Forums four times a year. Should the Council give any money to local groups when it is struggling to get enough money, for example, for older people’s social care? I think so. Having good things happening locally in our own communities is important. People shouldn’t always have to travel to take the kids out for the day. It’s important too for families to be able to have fun without putting their hands in their pockets all the time; visits to theme parks can work out very expensive. And that’s one reason why I loved the Mytholmroyd Gala this year. You could enjoy the activities and hardly need to reach for your money at all. I loved, for example, the free Noisy Toys stall at Mytholmroyd Gala, where children could try out various science experiments for free. Both boys and girls were really enjoying it and the adults couldn’t get a look in. So well done to everyone involved in all our community events, who have been planning, fundraising, stewarding, and perhaps just occasionally panicking. We appreciate it.